Hello, Here is a lovely stamp, in my view. Nothing really special but if you have a copy, have a careful look at it. 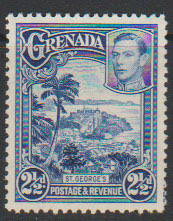 This is SG 157 from the 1938 definitive issue. It is perf 12½ and the catalogue value Mint and Used is 30p. Why look again? Well if it were perf 12½ by 13½ it is priced at £10,000 Mint. Even a used copy is priced at £190. We cannot help you fill this gap in your collection – try eBay where you will see used copies for around £120 to £130 – but we can help you with many other perf differences from Grenada, and many other countries. cddstamps has now loaded more GV through GVI from Bermuda, Grenada and Malta as well as a comprehensive collection of GB Security Machins from 2012 through 2015, including both large and small vermillion issues. Plenty of choices to help you fill a few gaps in your collection. And as a special we are giving a free pair of cddstamps tweezers for every order between now and October 5th. You can never have too many pairs of tweezers and anyway these are the same as the ones we use every day and, they are free with your order. (will be mailed separately I should add). Want three pairs, place three orders, four pairs place 4 orders etc - yes, we will mail you a pair for every order. No limit or catches. Get a pair for a friend or your stamp club perhaps. We bet you won’t ever want to use another pair once you have used ours.